Jalal Toufic is an amazing writer. He documents the moves of consciousness in a way that leads the reader ever deeper, from impasse to illusion to new impasse—turning the trap of “what can’t be named” into a true paradise. Both of his books [Distracted and (Vampires)] knocked me out; totally original, totally fascinating. Jalal Toufic is one of the best writers in America today. Although fluent in French and Arabic, he has chosen English as his language of expression and his first 2 books, Distracted and (Vampires), are some of the best writing of the past 20 years. Most theorists of cinema read, paradoxically, the avant-garde from the perspective of mainstream narrative film, whether unconsciously or not. 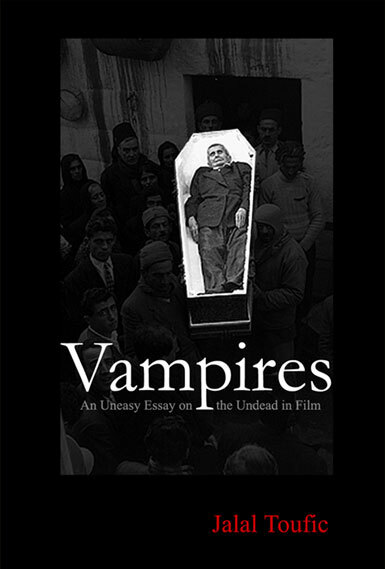 This complex and disruptive, stylistically heterogeneous and hermeneutically subversive text [Over-Sensitivity] continues the project of Toufic’s earlier book, (Vampires): An Uneasy Essay on the Undead in Film, in which the exigencies of avant-garde film, conversely, inform a broader reading of narrative structure, iconology, and epistemology. In this context, the author undertakes (an irresistible pun) the study of the previously neglected domain of narration from the point of view of the dead, inaugurating a major theme in which popular and traditional rituals intersect with the avant-garde. While the expanded and revised edition of my second book, (Vampires), is at one level an uneasy essay on the undead in film (the subtitle of the book), I consider it to be actually much more than that. Drawing on various altered states of consciousness I underwent, films and novels on the undead, psychiatric case studies and mystical reports, the book deals with many of the certainly dubious but also dubiously certain characteristics of the undeath state, for example: over-turns that undo the dead’s turn to answer an interpellation; doubles; frequent unworldly freezings still, ones that reveal the occasional worldly immobilization of the living as merely motion-less-ness, i.e. a variety of movement; the implicit indefinite fall of/in the cadaver; the turning of the metaphorical into the literal; and an unreality that sometimes behaves in a filmic manner (e.g., the lapses in hypnosis, schizophrenia, and undeath permit editing in reality), inducing the undead to wonder: “Am I in a film?” While my first book, Distracted, was written for the living, (Vampires) was written about and for those who are “mortals to death” (the title of a special issue I edited for the journal Discourse). It thus belongs—somewhat edgily given my reservations regarding the validity of guidebooks for the dead—on the same shelf as the Bardo Thödol and the Egyptian Book of the Dead.